The scenic Westmorland Way is a 95 mile walk through the old county of that name, which now forms the south eastern part of Cumbria. The route starts in Appleby, the county town of Westmorland, the perfect starting point in the shadow of the Pennine Chain. It then travels west and generally southwards, winding its way through some of the finest Lake District scenery, passing Ullswater, Grasmere and Windermere, before visiting the market town of Kendal. From there it follows the canal and tracks through woodlands and meadows to Westmorland’s only port, Arnside, on the shores of Morecambe Bay. We have a total of four holidays. Three cover the whole route, taking from 7 to 9 days, depending on how far you want to walk each day and how much time you have to look around. The fourth holiday is a Highlights walk, covering the most dramatic section through the Lake District, from Pooley Bridge to Ambleside. 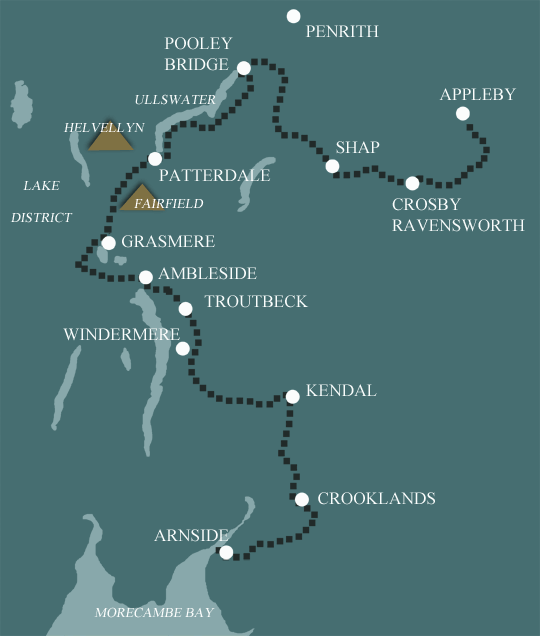 We offer 3 holidays along the full length of the Westmorland Way - the longer the holiday, the shorter you have to walk each day. The most dramatic and interesting section of the Westmorland Way for those with limited holiday time. A great introduction to the north eastern and central lakes along generally good paths. Explore Ullswater, one of the most interesting of the Lakes, from the nearby fells and lakeshore. 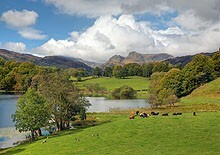 Stay in Grasmere, home of Dove Cottage, William Wordsworth's home. Explore bustling Lakeland villages and towns - lots of outdoor shops and good food! I have been on several Mickledore holidays and have enjoyed every one. Preparations, information and advice are excellent. I have always felt very confident and safe when setting off on these holidays. My companions have also enjoyed the holidays and have only praise for your company, Thank you for another great holiday. Would you use Mickledore again? Yes, definitely. As always on Mickledore trips, I had a very enjoyable walk. The accommodations were excellent. The hosts at all of the places I stayed were friendly and welcoming, and the breakfasts very good. You provide an invaluable service, especially for visitors from outside the UK, and you provide it well. Would you use Mickledore again? Of course.